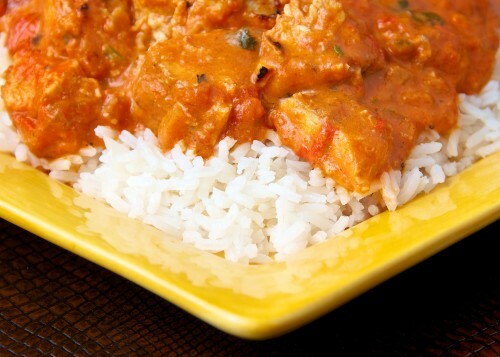 The bud exploding Indian classic, Chicken Tikka Masala recipe prepared in a slow cooker makes your holiday dinners easy and lavish. Mouthwatering as it is, your guests will never be able to guess that it’s so effortless and easy especially with our simple recipe. You may substitute chicken with beef, increasing the cooking time accordingly. The dash of garam masala powder- a combination of Indian spices- does the trick in recipe and brings out the classic ‘local’ tikka flavor. Place the chicken in the bottom of a slow cooker. Mix rest of the ingredients- yogurt, ginger, garlic, garam masala, paprika, lemon, cumin, oil and salt. Pour over the chicken and onion and stir well to cover the chicken pieces. Serve with onion wedges or Garlic rice along with the cucumber and mint yogurt on the side.